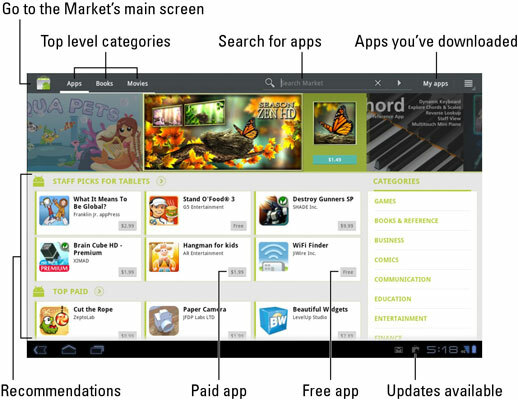 You access the Android Market by opening the Market app, found on the Apps Menu or Home screen. After opening the Market app, you can browse for apps, games, books, or movie rentals. If possible, activate the Wi-Fi connection to avoid incurring data overages. You can browse for apps or use the Search button to find an app by name or what it does. Free apps feature an Install button. Paid apps have a button with the app’s price on it. After touching the Install button, you’re alerted to any services that the app uses. The list of permissions isn’t a warning, and it doesn’t mean anything bad. It’s just that the Market is telling you which of your Tab’s features the app uses. This is a good time to peruse the list of services an app uses to look for anything unusual or out of line with the app’s purpose. For example, an alarm clock app that uses your contact list and the text messaging service would be a red flag, especially if it’s your understanding that the app doesn’t need to text message any of your contacts. Touch the OK button to accept the conditions and begin the download. Or, if you were doing something else while the app was downloading and installing, choose the Installed App notification. The notification features the app’s name with the text Successfully Installed beneath it. After you complete the initial setup, or if no setup is necessary, you can start using the app.